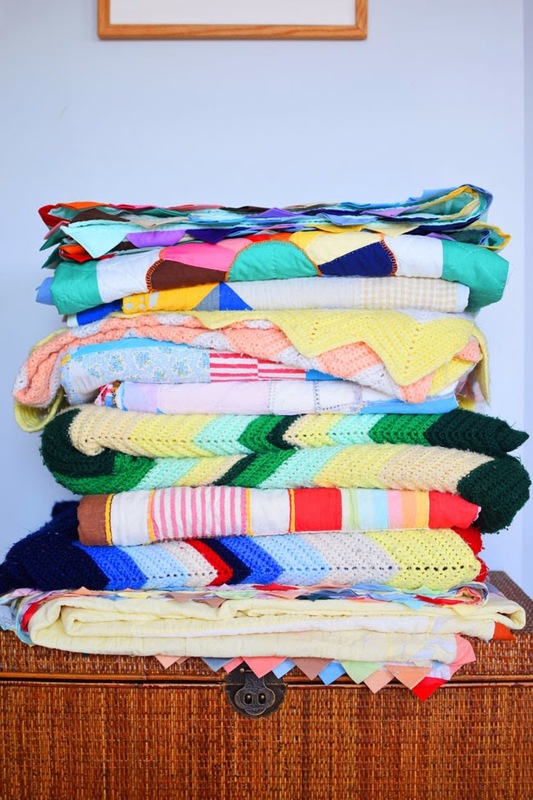 For this Vintage Bliss Tuesday, I rounded up my collection of prized granny blankets. When I say granny blankets, I literally mean blankets that my granny made. Only we called her Nana. So technically they are Nana blankets. I managed to locate nine of them, but I may have missed one or two. We use them in almost every room in the house. 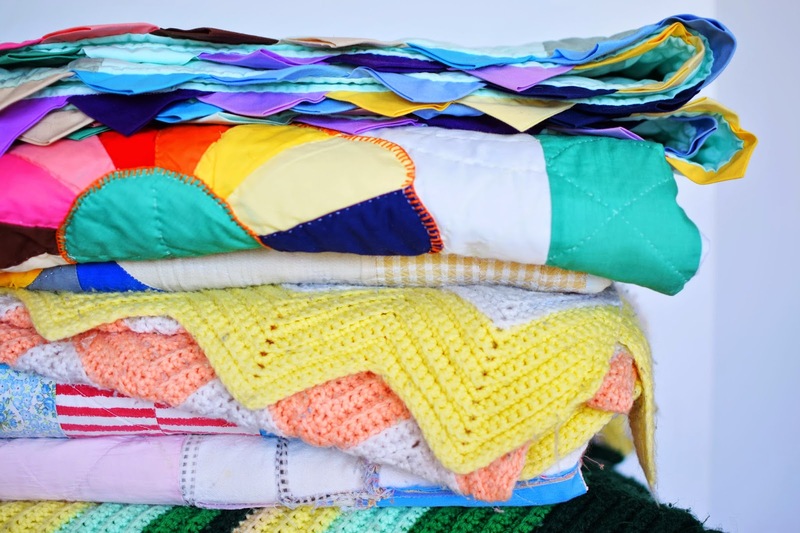 These quilts and afghans are so warm and cozy when it gets a little cool around here. And, for me, they are like a warm hug from Nana. I miss that baking, cooking, reading, story-telling, witty chick. But when I look at these blankets I think about all the time and care she put into them and I remember her fondly. Most of these blankets weren't intended for me, but my mom knows how much I like them, so she sent many of hers my way. Nana did a lot of patchwork quilts with leftover scraps of fabric. 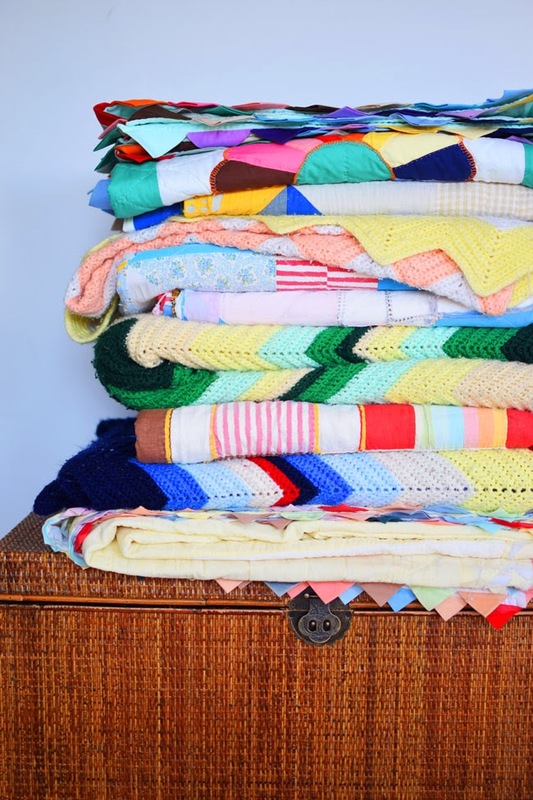 Some of those quilts aren't in the greatest of shape because they are the oldest and most used. The other quilts she made - with circular designs on them - are later work. The mainly green quilt at the top of the pile is the newest and is in great condition. I have no intention of locking any of them up in closets or trunks though. These babies are meant to be used and loved. I actually made the orange and yellow zigzag afghan as a preteen, with the help of Nana. My bedroom was done up in an orange and yellow colour scheme at the time. With lots of Duran Duran posters taped to my closet doors! Thanks for hosting this lovely party. I found two crochet afghan at Goodwill, they are in great condition, no piling or holes. I really appreciate and admire the time taken to knit them. Yours probably more sentimental as it made with love from granny. I would definitely pick them up too if they are in great condition. Not that I need more blankets, obviously, but that wouldn't stop me! How nice to have your Nana's blankets and quilts. A nice keepsake to keep passing down. I know what you mean Jo it is like getting a great big hug from Nana when I cuddle myself in one of her quilts or blankets. I miss everything about her too. They're all beautiful! My grandmother crocheted huge bedcovers for her children and I was also lucky to receive one. I don't use it though, because I'm worried about it getting damaged and I have this idea in my mind that the bedroom has to be perfect first before I will display it! So my mum has put it on her spare guest bed. Also my husband hates having bedcovers as he says he gets too hot (even in winter), and I would hate to wake up and see he has kicked it off the bed! WHAT??? How is that possible to have SO many when I have NONE? Maybe my gram didn't have time because she ran a dairy farm? But still I feel slight, totally!, jealous of your blankets!! Love them all.